Your uncle plays an important role in your life. In a way, they serve as our second fathers. Making sure your uncle birthday wishes are as special as him is just as important. Here, finding those types of birthday messages is easy to do. How will you know if you have chosen the right birthday wishes for your uncle? It's simpler than you might expect. Generally, if you think a birthday wish is good enough for your father, it will very likely be good for your uncle. In other words, make your uncle feel like he's special to you. If your birthday message choices meet this standard, you've discovered just the right birthday wishes for your uncle. The best uncles can be a backup for your dad, an older brother or just a great friend. When you choose your uncle's birthday message, it's a great opportunity for you to show your uncle just how much he means to you. The easiest thing to do is send your uncle generic (what I call safe) birthday wishes, but don't do it. Yes, the easy route is still "nice" because it shows that you have taken a little time out of your day to think of your uncle, but you can do better — much, much better. And you really should. Athletic uncle: Pick an inspirational birthday wish. 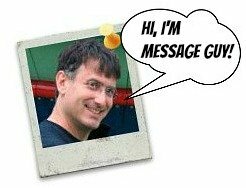 Worldly uncle: Choose a cute, clever or cool birthday greeting. 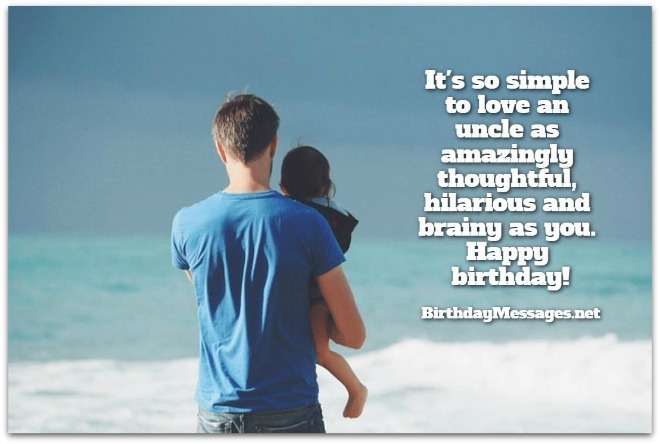 Cool uncle: Select a clever or cool birthday message. 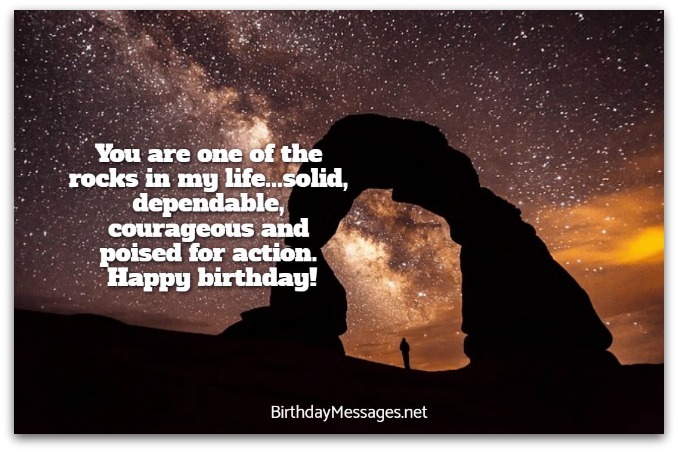 Artistic uncle: Opt for an inspirational, funny, cool or clever birthday verse. Infantile uncle: Go for a cute, sentimental or happy birthday wish. The tips above are only recommendations. Because you know your uncle personally, you can mix and match different types of birthday messages to come up with the right one for him. Or, if you've found one on this page, you don't have to change a thing (if you don't want to). Happy birthday! To the world's best uncle, may just the best things in life come your way every day and, most of all, on your birthday. On your birthday, it's the perfect time to tell you what you mean to me: you're the best uncle anyone could ever have. May all your birthday wishes take flight. I'm so proud to call you my uncle. You mean so much to me. May you only know the joy and wonder you've given me — a million-fold. Have a great birthday! It's so simple to love an uncle as amazingly thoughtful, hilarious and brainy as you. Happy birthday! You are one of the rocks in my life...solid, dependable, courageous and poised for action. Happy birthday! Uncle, you have forever been a very important part of our lives. We will always be grateful for all the support, fun, love and happiness you bring us every time we see you. Happy birthday! I'm so fortunate to be able to count on an uncle like you, someone who loves me, someone who's so easy to love right back. Happy birthday! Uncle, you matter incredibly to me and the whole family. I'm so happy you are in my life. Happy birthday! May your special day give you hours upon hours of happiness, love, adventure and everything else you have always wished for! Happy birthday, Uncle! Uncle, I wish you a wonderfully happy birthday and even more wonderful year and onward! Happy birthday! Your birthday is the very best moment to celebrate all those amazing times, too many to count, you've been the world's best uncle. You are the brightest star in the whole universe! When you shine your light, everyone's lives are illuminated. Happy birthday! There are a long line of incredible men in my life, but you are definitely at the front of it — today and always. Happy birthday! Since I don't say I respect you, I love you and I value you enough to you, I will say it over and over again: Uncle, I respect, respect, respect, respect you and I love, love, love, love you and I value, value, value, value you. Happy birthday! No "generation gap" exists between us. I may be years younger than you but you're the coolest, youngest-at-heart uncle anywhere. Happy birthday! 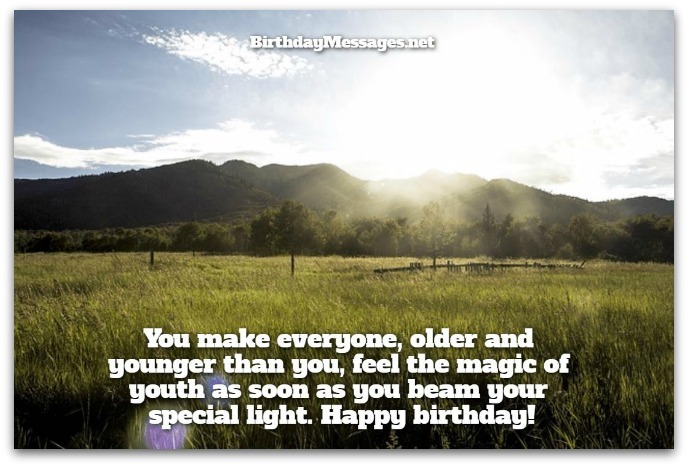 You make everyone, older and younger than you, feel the magic of youth as soon as you beam your special light. Happy birthday! You deserve a special day fit for a king, a truly royal affair with only the finest: the finest wine, the finest cuisine, the finest people and the finest time. Happy birthday! You've always told me that you would rather be lucky than smart, so I wish you the best of luck because you're the smartest man I know. Happy birthday, dearest uncle! Uncle, the years have been good to you. I hope you have many more years to conquer with such grace. Happy birthday! Happy birthday. May you be as healthy and happy as you are today. You certainly deserve years upon years of health and happiness! I'm so fortunate to have such an exciting, happy and fun uncle like you! May your birthday be as exciting, happy and fun as you are. My life and the lives of everyone in our family would not be as interesting as they are now...if you weren't here. Our best wishes on your birthday, dearest uncle! My past, present and future have one amazing thing in common: your guidance, your love, your humor and your courage to set me straight whenever my life goes off the rails. Thank you...and happy birthday! You may never admit it but your uncle is more important to you than you realize. 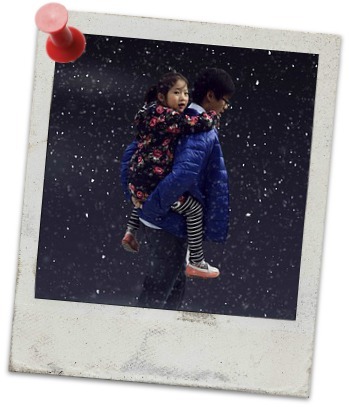 To see what I mean, take a moment to read The Importance of Aunts and Uncles in a Family, on myfamilydigest.com. And if anything in this article inspires you to add to any of the uncle birthday wishes on this page, go right ahead. Don't even hesitate for a second.